Many fans around the world are still mourning the loss of the great Adam West. The actor, best known for his work on the 60s Batman TV series, passed away last week at the age of 88 after a short battle with Leukemia. Those who cherish the late actor's work as Batman do have something to look forward to, as Batman Vs. Two-Face, an animated movie coming from DC later this year, is going to bring back Adam West for one last go as the Caped Crusader. 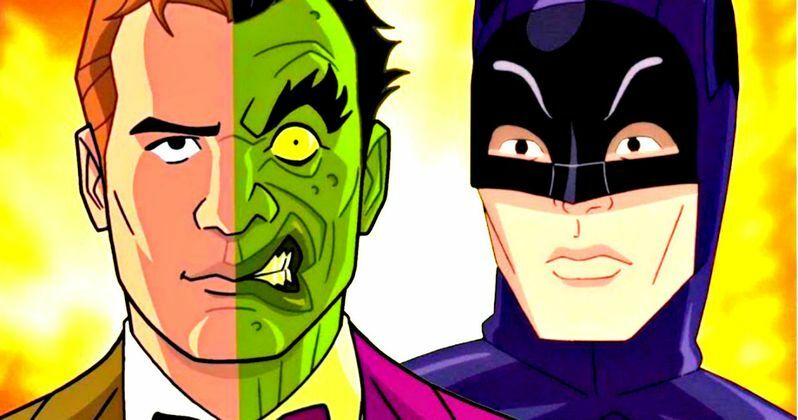 Batman Vs. Two-Face was announced last year at New York Comic Con and will bring back the cast of the Batman TV series. But since the movie hasn't come out yet it wasn't clear if Adam West had completed his work on it. Fortunately, IGN was able to get confirmation from Warner Bros. that Adam West had completed his voice work on Batman Vs. Two-Face months before his passing. So the 60s Batman is going to give some evildoers some much needed justice once more, which is great news for fans who have been mourning his loss. "Former Gotham City District Attorney Harvey Dent, one side of his face scarred by acid, goes on a crime spree based on the number '2'. All of his actions are decided by the flip of a defaced, two-headed silver dollar." As the title implies, Batman Vs. Two-Face will be pitting Adam West's "Bright Knight" against Harvey Dent, aka Two-Face. During the course of the 60s Batman series, the DC Comics hero fought many of his traditional foes, including Mr. Freeze, The Joker and Penguin. However, Two-Face never appeared on the series, so bringing him into that world in this animated movie is pretty special. What's more is that Captain Kirk himself, William Shatner, is providing the voice of Harvey Dent/Two-Face in Batman Vs. Two-Face. So this could wind up being a whole lot of fun. Batman Vs. Two-Face is the sequel to 2016's Batman: Return of the Caped Crusaders. That movie also featured Adam West back as Bruce Wayne, with Burt Ward as Robin and Julie Newmar as Catwoman, essentially reviving the old Batman TV series in animated form. It is also well worth noting that Batman: Return of the Caped Crusaders was very well-liked, as the movie currently has an 89 percent approval rating from critics on Rotten Tomatoes, with a 70 percent audience score. So, not only are we getting more of Adam West's Batman, but it looks like it could be quite good. Director Rick Morales returned to direct Batman Vs. Two-Face after helming Return of the Caped Crusaders. Warner Bros. has not yet set a release date for the movie, but it is going to arrive later this year on Blu-ray/DVD and digital platforms. It also seems like a very safe bet that there will be some sort of limited theatrical release for Batman Vs. Two-Face, and we'll be sure to keep you up to date as those details are made available.